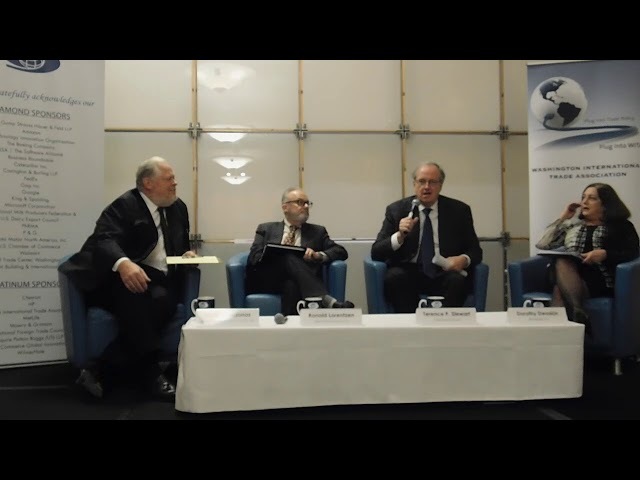 Event videos > 11/8/18 What’s Next for the World Trade Organization? 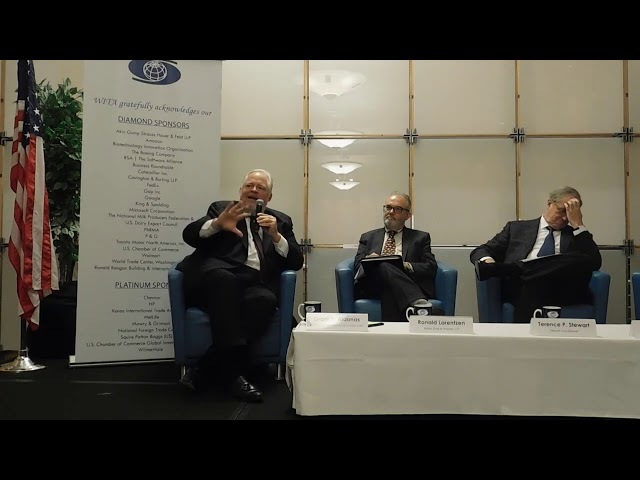 WITA held a policy panel discussion, which examined the future of the World Trade Organization (WTO) as well as the prospects for reform of the organization. What’s Next For The World Trade Organization? On November 8th, the Washington International Trade Association hosted the event “What’s Next For The WTO?” featuring a panel of experts that included Terence P. Stewart, Managing Partner at Stewart and Stewart; Ronald Lorentzen, Senior International Trade Advisor at Kelley Drye & Warren LLP; Grant D. Aldonas, Executive Director of the Institute of International Economic Law at Georgetown University; and Dorothy Dwoskin, Principal at d2Strategies examined the future of the WTO and discussed the prospects to reform the organization. Terence Stewart began the discussion by framing the importance of the WTO within the tremendous changes and technological transformations that have taken place in the global trade system over the past few decades. He used this analysis to highlight his concerns about the trading system, saying that, ”this system contains 20th century rules for a 21st century world …the loss of effective negotiations capabilities within the WTO, since it flows from a consensus-type of approach that historically has worked with a smaller group of countries”. He emphasized how nations are increasingly joining together through meetings to consider some of the issues that the U.S. has with the system and bringing a broader reform to the table. These initiatives are reflected in the EU paper, published last September and the Canadian paper published this October, which highlights the necessity mention to reform the WTO. He emphasized on the “mini-ministerial” meeting in Ottawa where 13 countries gathered to discuss whether there were ideas that they agreed to, to reach out to other countries to see if there could be a reform about these ideas. Furthermore, there have been trilateral initiatives such as U.S.-EU-Japan to help deal with distortions that flow from a state-control economies, like China. Next to speak was Ronald Lorentzen. He asserted that the WTO matters because, “it is the most efficient way to maximize adherence to a single set of rules to deal with disciplines that affect trade. If you want a baseline that’s going to work for everyone you need something like the WTO”. He believes it is a worthwhile time investment to seek improvements for the WTO. He laid out 2 areas that could cover the reformation of the WTO, these being: 1) Functioning of the current system and 2) Scope and content of agreements. As for the functioning of the system, Ron mentioned 3 pillars that are supposed to be the underpinning of the WTO’s mission: negotiation, implementation and dispute settlement. These pillars are considered fundamental to the WTO’s role, so it is important to know how to implement more rules efficiently. He said it was important to notice that implementation does not only occur domestically, but it can also be applied in the regular work of the committees and the bodies of the organization. As to the scope and content of agreements, Ron noted that these need to reflect ongoing trade production and political developments. He argued that different factors should be considered. Principal among these are the growing importance of addressing state-led economies, the need to include global value chains and a reconsideration of the founding principles of the WTO. Ron provided suggestions on what should be done if the WTO is to be reformed. His first suggestion was to establish definitions according to each country’s economic system (state-led or market-oriented). Second, we need to distinguish the difference between state-led economies and developing economies in order to apply fair treatment. Third, Ron talks about trade and competition, how to compete but in a fair manner. Fourth, identify which factors are not going to change in a state-led economy and which rules the WTO should apply as to not affect others within the system. Fifth, include issues such as subsidies in services, restructure antidumping and countervailing measures to better reflect the reality of global supply chains and take into an account the prevalence of multinational competitors having production facilities situated in different jurisdictions. His final suggestion is to reconsider the founding principles of the WTO. Next to speak was Grant D. Aldonas, who focused on the political aspects of the reform. He mentioned that if they go back to the GATT, there has always been the factor of “reciprocity” in multilateral and bilateral agreements and relations. Grant also added that there is an assumption to how the US bargained, which is why it is important to know the perspective the current Administration has on the principle of reciprocity. Grant talked about the actual role of Congress in trade and how their main interest is getting deals for workers in trade agreements. Additionally, he talked about what was on the news that calls for attention such as the Brazil’s President-Elect Bolsonaro and how he is taking a similar approach as President Trump with bilateral trade deals. There is also a deep resistance to what China represents as a deviation from the norms of the system, making the U.S. a victim of the trading system instead of a beneficiary of the trading system. Post-Brexit proposals are not taking into consideration a multilateral perspective either. May of these examples illustrate several measures that are not reflective of the WTO rules, but rather more bilateral approaches. At the Ottawa meeting, countries didn’t talk about actual reform, but it was only a discussion about what new issues should they include or should they talk about. They acted based on assuming that they had support from other WTO Members on the idea of negotiating under a reciprocal basis, rather than actually identifying whether or not is it possible. Dorothy Dwoskin compared Free Trade Agreements (FTAs) in relation to WTO rules, then posed the question, “is it time to look for different kinds of agreements?”. Dorothy noted that FTAs can be negotiated at a plurilateral level but results have to be implemented on a MFN basis. She found it interesting that for the Tokyo Round, like-minded countries got together to discuss subsidies, procurement, licensing, and other issues concerning the countries at that time. She also mentioned that in regard to special and differential treatment countries need to really consider if they still need it. Regarding transparency and notification, countries don’t negotiate in public but all of the documents that are meaningful in the WTO are just job documents, and not necessarily public documents, so other Members can’t see the proposals that have actually been made. One interesting thing that the U.S. has done, according to Dorothy, is the move from e-commerce to digital trade and taken moratorium on customs duties on electronic transmissions and put it at the center at the digital chapter. During the second round of discussion, Terry mentioned that the likelihood of reform is not bright. He also noted that if the talks move in a multilateral manner, then the MFN principle is an impediment to that because of the existence of “free-riders”. As for preferential treatment, the EU and Canada papers talk about encouraging countries to graduate themselves or to agree that on new agreements preferential treatment will be based on need and not self-classification. Ron suggested to clarify which agreements they are looking for within the system: market access agreements or rule-based agreements. There is also a need for a deep dive on definitions and labels. Grant talked about how the current U.S. Administration should focus in on one goal, such as preventing free riding in the agreements. He said there is a way to achieve such goals without bringing the system down. He noted that if the U.S. uses a bilateral approach, it actually reduces the tools and arguments in support of a multilateral system. By pursuing bilateral agreements, they maintain a smaller degree of leverage compared to trying to do the right thing with plurilateral agreements. At the end of the Q&A with the audience, Dorothy asked what are some of the positive steps that the U.S. can take to initiate examination of long term issues with the WTO. Terry argued that enhanced dispute settlement was crucial to meaningful reform. Ron talked about transparency and forcing countries to show how they come to their decisions. Finally, Grant agreed with Ron on the importance of transparency since it is good for the system because the information provided in the market allows for the political market to work. Grant D. Aldonas, Executive Director, Institute of International Economic Law, Georgetown University Law Center; former Under Secretary of Commerce for International Trade, Department of Commerce Ronald Lorentzen, Senior International Trade Advisor, Kelley Drye & Warren LLP; former Principal Deputy Assistant Secretary Enforcement & Compliance (E&C), Department of Commerce Terence P. Stewart, Managing Partner, Stewart and Stewart Moderator, Dorothy Dwoskin, Principal, d2Strategies LLC; Former Assistant USTR for the World Trade Organization (WTO) and Multilateral Affairs, Office of the US Trade Representative To view more details about the event, click here.